LANCASTER, Pa. -- Chris Jericho stood with his back to the hyperactive crowd, his arms outstretched and lights flashing on his jacket. The classic Jericho pose had been an anticipated staple at WWE arenas for years. 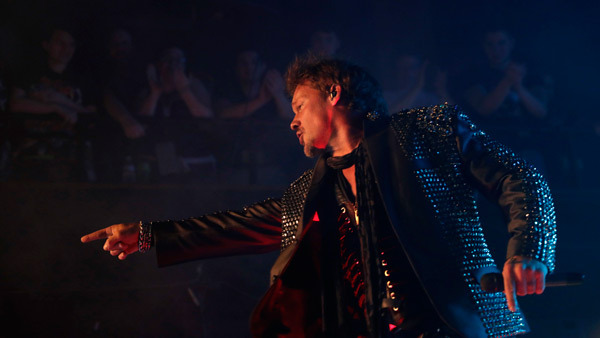 Posturing in a blinged-out $15,000 jacket (so he bragged each week on "Raw") earned him "Jericho" chants from wrestling fans, but the two-syllable shout from about 400 hundred sweat-soaked faithful recently stuffed inside a sweaty club were for "Fozzy! Fozzy!" "I could just stand here and listen you to say 'Fozzy' all night long, man!" he told the crowd. Jericho's been billed as Y2J and The Man of 1,004 Holds. But these days, the entertainer who just last month went hold-for-hold at WrestleMania has traded wrestling for rock and is on tour with his long-time metal band, Fozzy. "I think a lot of times, when people hear Fozzy, they think I'm going to be on stage in spandex, doing body slams, and singing about jumping off the top rope," Jericho said. Mainstream music has started to pick up on what true metal aficionados have known for years; Fozzy can rock, and the band's latest single "Judas" just may be Jericho's biggest smash hit outside the ring. "We've had some success with some of our songs, but this one has gone through the roof," Jericho said inside his tour bus. "It's really taken us to a whole different level." The music video for "Judas" has hit 3.5 million views on YouTube in just two weeks and was the theme song for the WWE Network show NXT TakeOver: Chicago. Fozzy had a spot this month on the Carolina Rebellion festival headlined by Soundgarden, Def Leppard and Avenged Sevenfold. There are other festival dates sprinkled on the tour that included stops in Pittsburgh ; Des Moines, Iowa; and Asbury Park, New Jersey. Jericho and friends started the band on a lark, just a couple of shows back in the late 1990s under the name Fozzy Osbourne. The original incarnation was mostly a cover band that had concocted a Spinal Tap-esque back story and saw Jericho adopt the front man persona of Mongoose McQueen. They released two albums in the early 2000s filled mostly of cover songs from bands such as Iron Maiden, Black Sabbath and Scorpions. Fozzy, its name now shortened, even appeared on the Howard Stern Show in a battle of the bands competition against a ragtag group assembled by the shock jock. "We came in there. No more names, no more costumes. Let's be us," Jericho said. "And we killed 'em." By early this decade, the covers and satirical spin had largely been dropped and Fozzy attacked with a more a serious - yet just as ear-ringing - approach. Jericho, who once defeated The Rock and "Stone Cold" Steve Austin on the same night to win the WWE undisputed championship, scaled back his wrestling career and showed up when breaks by the band allowed him to hit the ring. Fozzy's current lineup also includes Richard Ward (guitars, vocals), Frank Fontsere (drums), Billy Grey (guitars) and Paul DiLeo (bass). "I don't want to play with any other members," Jericho said. "This is the quintessential Fozzy lineup." Jericho (born Chris Irvine, son of former NHL forward Ted Irvine) is grateful he's not in a position to choose one profession over the other. Jericho had earned the freedom from WWE to mostly come and go when it works with his schedule. "WWE, it's the brand name. I'm just a cog," he said. "An important part of it, people like it. But this is our band. People are here to see us. That to me, is a little more of a rush. It's not under the auspices of another name." If a wrestling career could be read like statistics on the back of a baseball card, the 46-year-old Jericho would be coming off a career year. His bad guy partnership with Kevin Owens made both wrestlers regulars in championship bouts. Owens, after a devious whisper in his ear from Triple H, turned on Jericho and their best friends-turned-enemies feud was highlighted by a sensational match at WrestleMania. He hasn't ignored on stage what made him popular in WWE as he interacts with the crowd before guitar licks for "Lights Go Out " and "Do You Wanna Start A War " whip it into a frenzy. He wears the scarfs, the metallic jacket and uses his catchphrases toward a crowd at the Chameleon Club that mostly wore his WWE T-shirts. He ended the show with his most popular phrase - "Lancaster ... you just made The List !" Jericho, more ripped than your average singer, is booked for a couple of overseas WWE shows in the summer but is unsure when he'll make another lengthy return. "It'll be a long time before I go back," he said. "If I ever do go back, if I never go back, it's fine. If I never wrestle another match, it wouldn't bother me." Until then, the Fozzy chants will echo through the summer nights. Drink it in , man. "It's the most chantable name in the world," Jericho said, smiling.